Some of you may know that I have been fundraising to build a school in Laos with Pencils of Promise (apologies to those I have been hassling over the last few weeks), but it’s done! Between 8-Oct-15 to 26-Nov-15, US$25,050 was raised from 80 super generous friends in 46 days which will build a school to benefit 80–100 kids. 1. I have very generous friends. Thank you to all who donated. I gave myself 12 months to raise US$25,000. Using Classy’s guide and my list of contacts and their recommendation of a 3% conversion rate at US$10, I guestimated it would take me a year to raise US$25,000 but it happened in 46 days which goes beyond my wildest expectations. The average donation is US$310 which is very high compared to international benchmarks. Raffles is my high school. 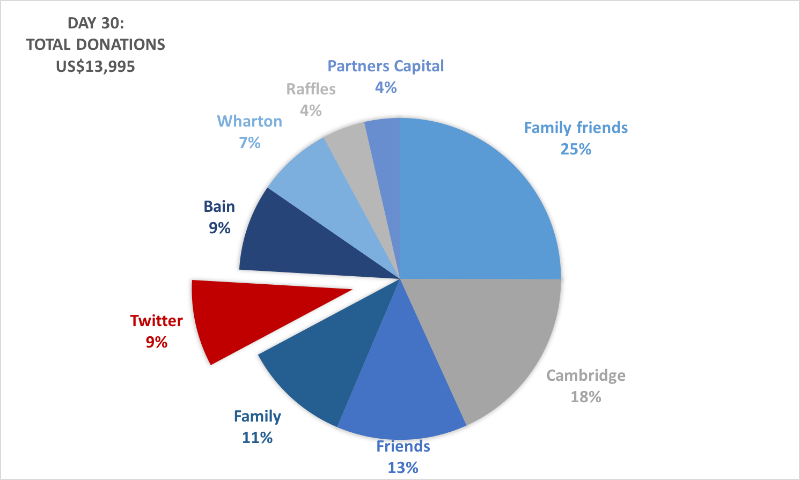 My donors from Cambridge, Wharton, Bain and Partners Capital are a consequence of my education. 3. I have a lot friends that I did not go to school or work with. What was interesting to me were the 21% of friends in grey that are my “social friends”, i.e. I didn’t go to school with or worked with.. which turned out to be the second largest category. 4. Twitter has been and continues to be a surprisingly successful component of my campaign. 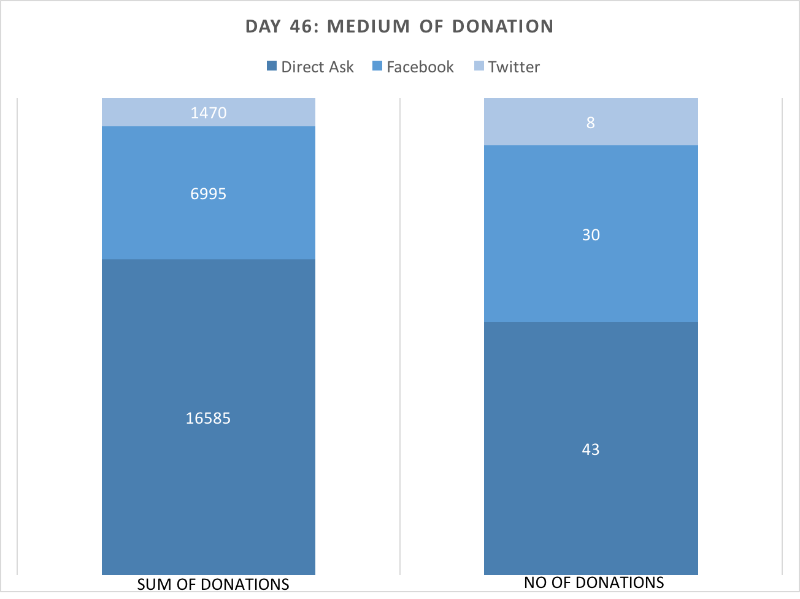 On Day 30 of my campaign, I published a post “The Value of a Tweet” which showed at that time, Twitter comprised 10% of my donations, with the average Twitter donation at $174 (Day 46: Ave Twitter donation is $184). These are anonymous donors, except for one. 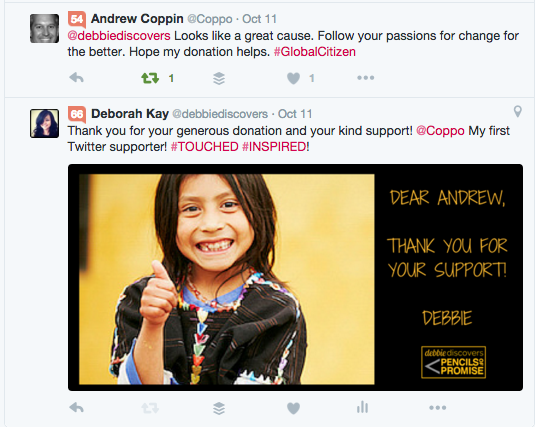 Andrew Coppin from Australia — he was my 8th donor and my first Twitter appeal. Here’s the back story: I remembered a Tweet about Warren Buffett that got good engagement and I posted a simple quote. 7 minutes later, I got a $240 donation from Andrew. Thank you Andrew (and apologies if you’re being spammed for donations the way I’m being spammed for other people’s fundraising campaigns). I subsequently scraped Followerwonk with a tool I’m not going to mention (because import.io doesn’t work anymore after Datanyze posted about it!) 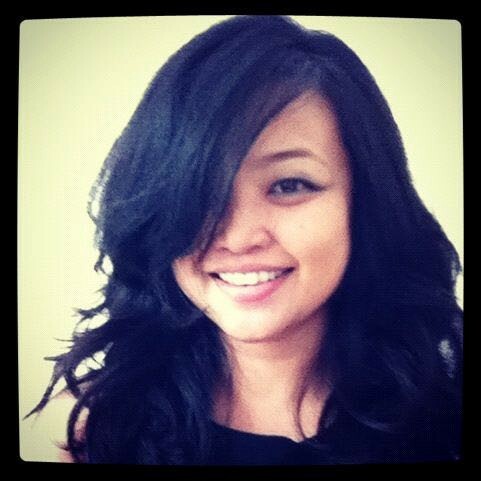 for Twitter bios with Investor and Philanthropist and I got a lot of Retweets, Likes Followers and donations. The possibilities are endless — now that I can tweet from my spreadsheet thanks to Blockspring, I can scrape Educator + Philanthropist, Parent + Philanthropist etc… and send 1,000 tweets a day with my free API calls. 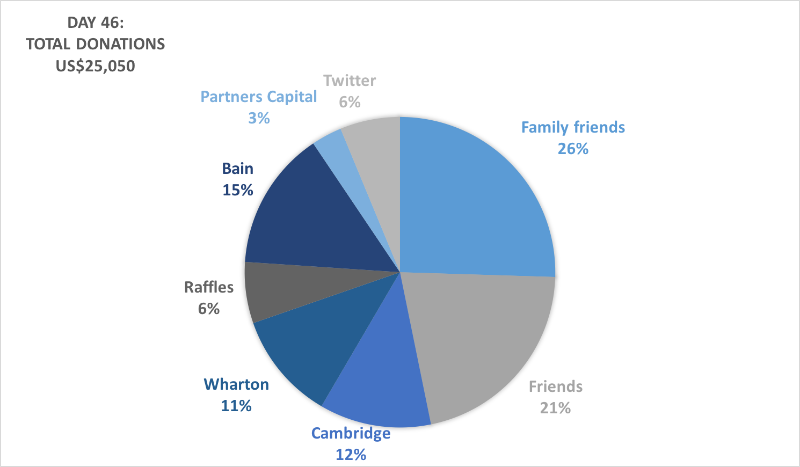 26% of donations came from my parents’ friends: older, wealthier, more philanthropic, donating very large amounts. I was researching the psychology of fundraising and came across very interesting research done by UCL which showed that men donate 4X more if they see a large donation by another man and if the fundraiser is a attractive, smiling woman (even for altruistic causes — it’s called “competitive altruism”). This goes back to evolutionary biology where signalling comes to play at a subconscious level (or so we hope). Wealth is a signal of attractiveness to women, whereas good looks is a signal of attractiveness to men. Fascinating. After I shared that the average Twitter donation from a stranger was $174, the average donation rose to $340 almost all coming from men. Whether it’s coincidence or correlation, it doesn’t imply causation. Hidden landing pages on my website. That’s all I’m going to say. And it doesn’t work on women. debbiediscovers.squarespace.com (discontinued – liked the ease of use and the stylish templates, but didn’t want to pay fora demo site. This allowed me to build my fundraising website (and my hidden landing pages) in less than half a day. And it allowed me to change the colour of the buttons on my free Weebly site thanks to Neil Patel (on how to create the perfect Call to Action) and Shay Howe (thank you for your amazing HTML / CSS lessons!!) Changing the color of a button on a Weebly site continues to draw the most traffic to that website! I even had someone ask me for CSS advice on how to add hover animation to the buttons on Disqus! Imagine that!! I have 50 Webydo sites that I don’t know what to do with and #XPRS freaking ROCKS. The Grid has been a massive disappointment though. 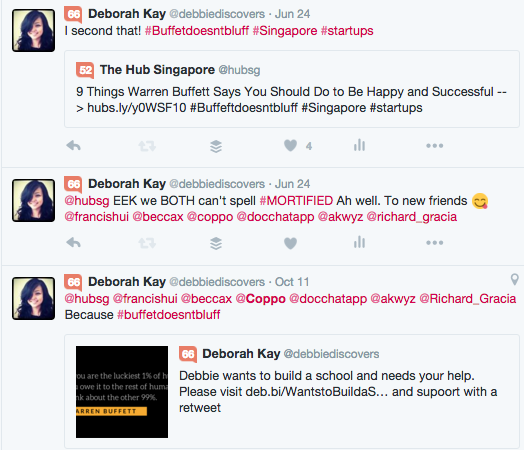 That’s also how the @debbiediscovers nickname came along — I wanted it to seem like I was “discovering” all these new website builders while building free sites. It’s also a parody of a 1980’s film — I’m sure the boys know which one I’m talking about. (OMG no one gets this, ok it’s about some girl called Debbie in some city called Dallas). The interesting (but not deliberate) consequence is if you search Deborah Kay or Debbie Kay on Google, you get 16.7M search results and I probably don’t even feature. Note: I subsequently added more bunch of videos and renamed them with my keyword and HAH now I outrank those stupid episodes. Though I was posting on my Facebook page, my personal Facebook profile, Twitter, most of the donations came from Direct Asks. This is not something that is within my comfort zone — I hate asking people for money. What I discovered about myself is that if it is a cause that I really believe in, I have no problems asking people for money. The key is to ask one-on-one directly. Group asks are not effective. But my skin is thicker, this campaign ain’t ending EVER (I’ve committed to raising another US$50,000 by the end of the year with really fun Xmas campaigns). If you’re one of the friends who I’ve asked and said you’d donate but haven’t, I understand, you’re busy. But I’m going to keep pestering you. If I haven’t asked you, I will soon enough. Pencils of Promise do not do charity work. They make long term investments. They’re data driven, ROI driven, and 100% of your donation goes to the school build, all their admin / marketing costs are covered by private donors. They’re also collaborating with TED prize winner Sugata Mitra to test his Self Organised Learning Environments in Ghana. 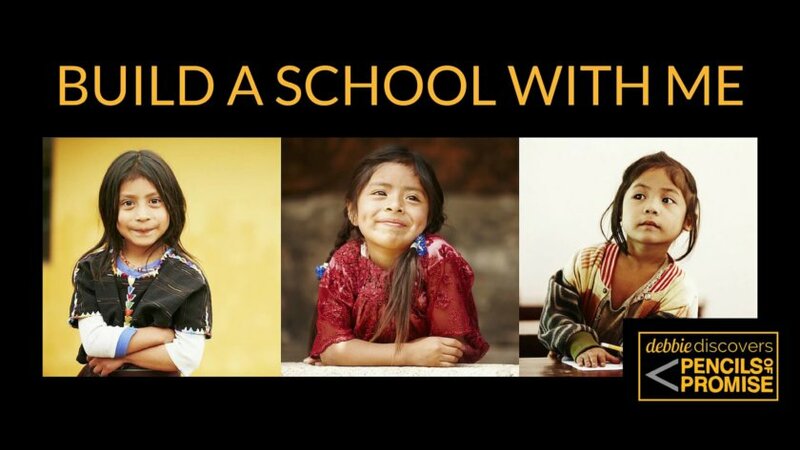 Learn more about Pencils of Promise and my other fundraising campaign ideas here: http://deb.bi/WantstoBuildMoreSchools.